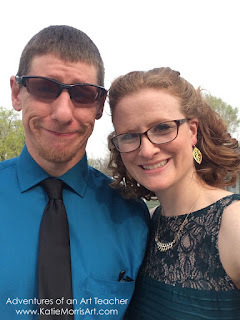 I posted a little while ago about being a prom sponsor and the very first prom I planned inspired by Back to the Future. 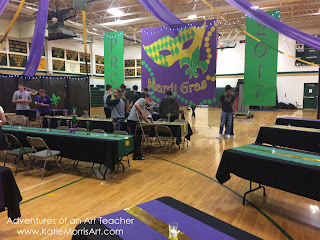 The second prom we worked on was a Mardi Gras theme. I started collecting ideas and inspiration on a Pinterest board and added anything that the committees sent me. 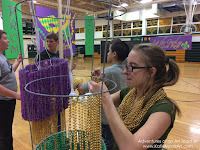 If you ever do this prom theme, MardiGrasOutlet.com was the cheapest place I could find to order throw beads, and we ordered a bunch! Here are some pictures of our set up. 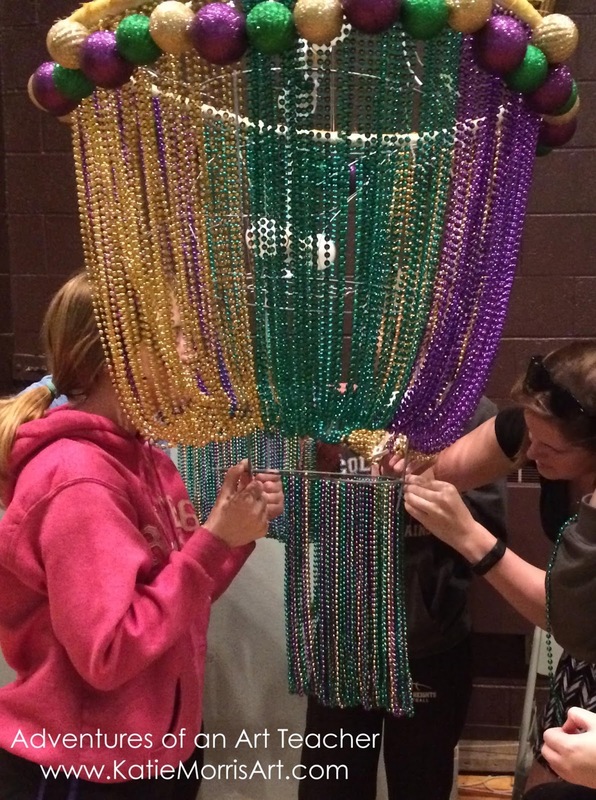 We made chandeliers out of tomato cages and a hula hoop for the large one. 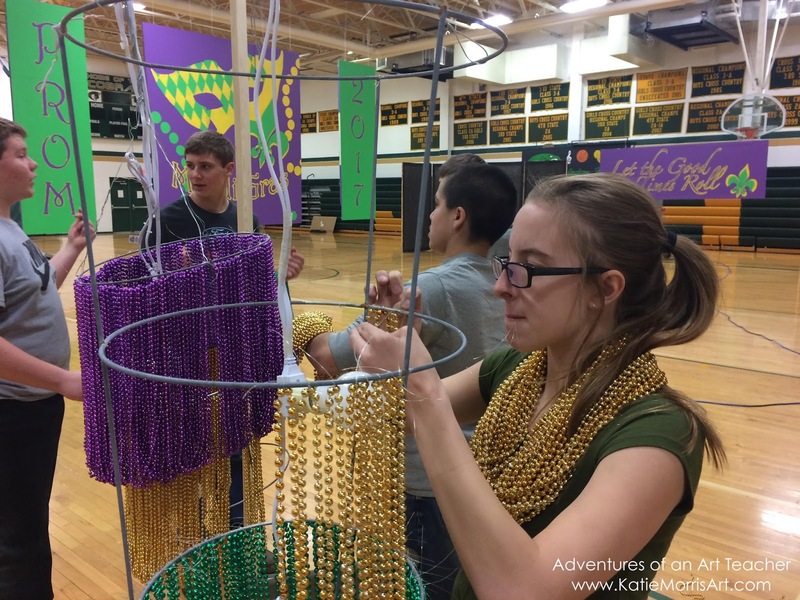 The throw beads were strung with loops of fishing line. The largest chandelier had purple, green, and gold ball ornaments I bought 50% off after Christmas. I can't find the picture now but the chandeliers looked really cool on the big night. Centerpieces were small glass globes from Dollar Tree- you can order a case and get it shipped to the store for free- filled with purple water beads and glittery floral picks I also bought really cheap after Christmas. 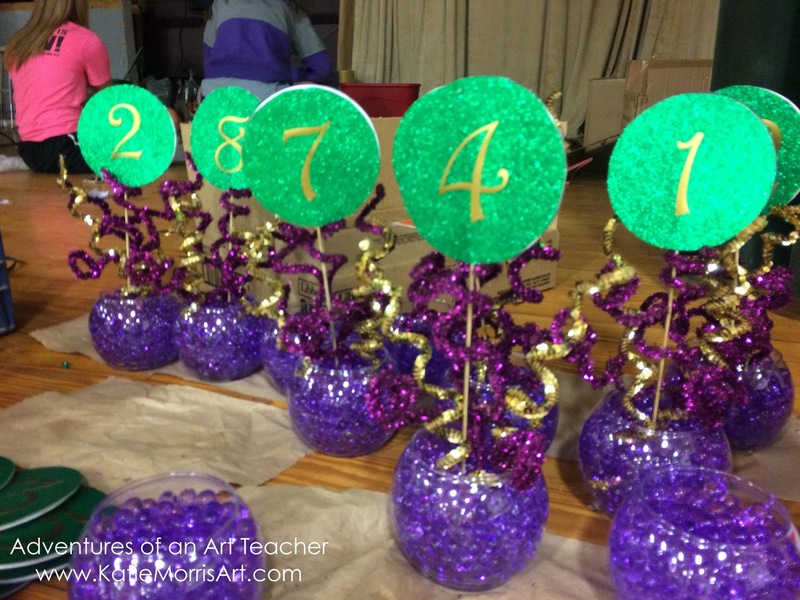 The table numbers are gold vinyl on green glitter paper sandwiched around a gold spray painted bamboo skewers. 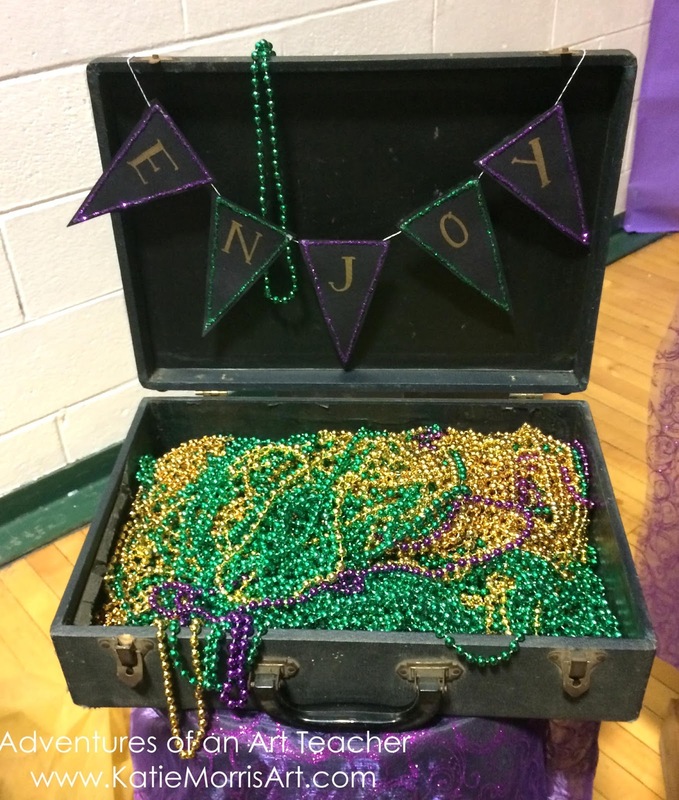 The water beads looked really cool, but I don't know if I'll use them again as the students were REALLY in to bouncing them across the floor and I was afraid someone would slip. We alternated purple, green, and gold 19" gossamer as a table runner with a thinner gold mylar ribbon down the center. 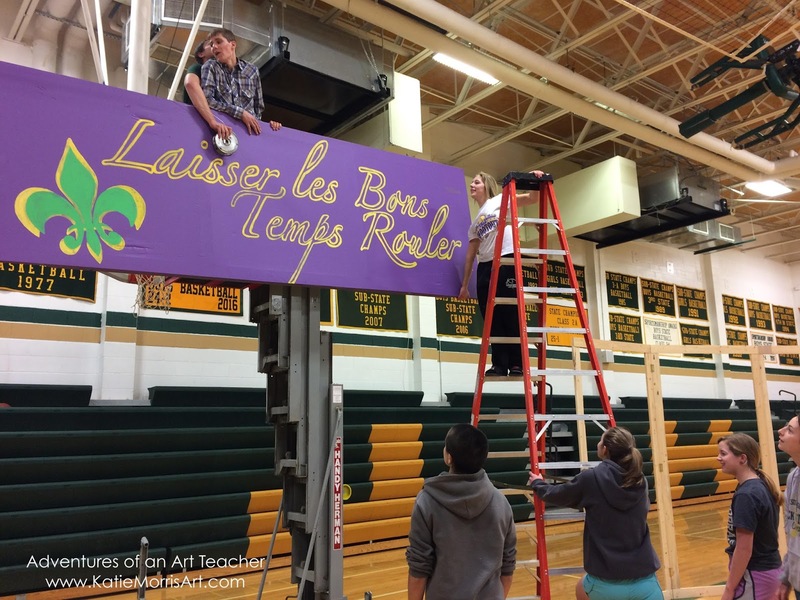 We used the same gold ribbon between wider purple gossamer to decorate the ceiling. 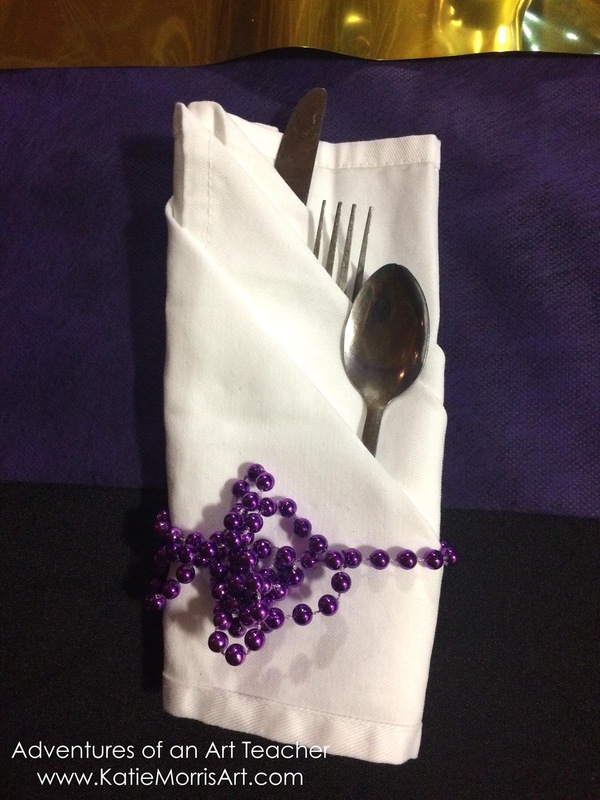 We had Mardi Gras beads around each set of flatware and extras in an old suitcase. There were still a ton leftover after prom. 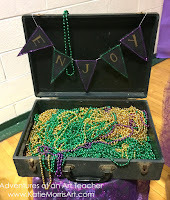 Thankfully our school colors are green and gold so they are serving as spirit items and I was able to sell the leftover purple necklaces to another school so they can use them as a fundraiser. And here is a picture of me with my forever prom date. He makes supervising prom a lot more enjoyable.